NOTE: This collaboration was planned way before the news about the rehabilitation of Boracay Island was announced. Some establishments like hotels, resorts, restaurants and other businesses are given an ultimatum to evacuate. This move aims to restore Boracay’s original beauty and make it competent to be one of Asia’s prime tourist destination. The island was closed for rehabilitation from April to October 2018. As I publish this, rehabilitation is still ongoing but they’re allowing a number of tourists to come in. I am posting this still to give you an idea on where you can stay in this popular island in case you’re going soon or after the planned rehabilitation. I am also posting the current status of the hostels mentioned. It is no secret that I love Boracay Island. For me, this is a perfect escape destination where you can just go on an island hopping tour, eat and drink with your friends outdoors, dance in the clubs and pubs, meet new friends and more. I’ve lost count on how many times I’ve been to Boracay. There are trips when I stayed in the luxurious hotels (thanks to press trip invitations and prizes I won in a number of contests I’ve joined in the past), mid-range accommodations and yes, hostels. Like in other places, staying in hostels is the best thing to do when you’re traveling solo and want to enjoy the company of other people. If you have limited budget, this is also the perfect alternative for you. 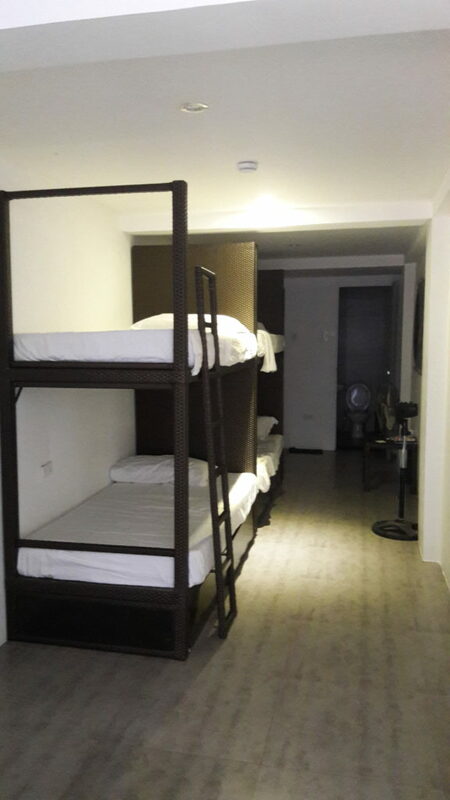 If you’re visiting Boracay soon, you may want to consider staying in one of the hostels. I’ve asked fellow travel bloggers (foreign and local) on which is the best place for them. I’ve compiled them for you so read on! Frendz Resort Hostel Boracay has everything. 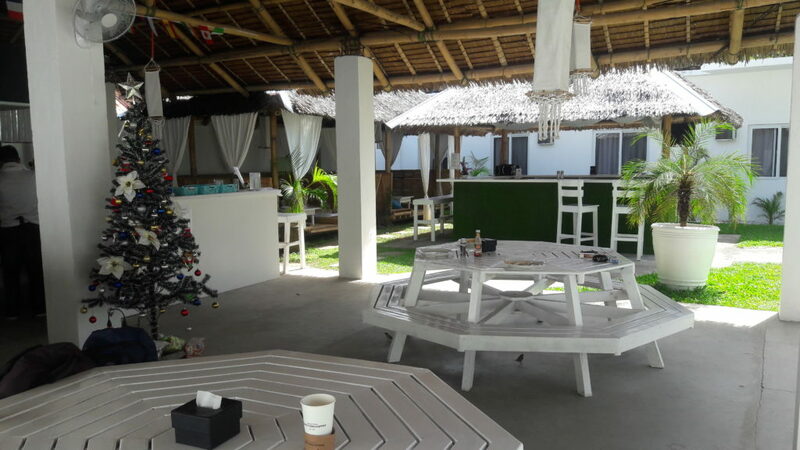 It’s only two minutes walk from White Beach, it has affordable dorms and privates, a pool, a bar and restaurant and many tours and activities of Boracay. There’s great air conditioning, WIFI, Happy Hour is regular and free food nights! Plus, it’s made with authentic Bamboo décor and has a real vibe. Unlike incoming investors and other hostels, Frendz doesn’t try too hard to be what it is – it’s for everyone and has the best vibes to go with. The staff make it! The biggest USP of Frendz is that is has a social balance. If you want to meet people and go out you can, whilst otherwise you can eat some great food and relax. Frendz is not a chain or a big resort so you know you’re getting the real experience stay here. EXTRA TIPS: Take advantage of the extra tours on offer at Frendz, from boat trips to bar crawls! Also, pasta night is a weekly event with free pasta for everyone! Happy Hour prices drop too but the vibes rise! I genuinely wouldn’t enjoy Boracay without Frendz. It has so much spirit and rawness that doesn’t exist in many other hotels and hostels nowadays. Frendz’s is real and brings you back down to earth. Great staff, food is tasty, rooms are neat and the pool is a plus! You feel like you’re in your own world at Frendz! 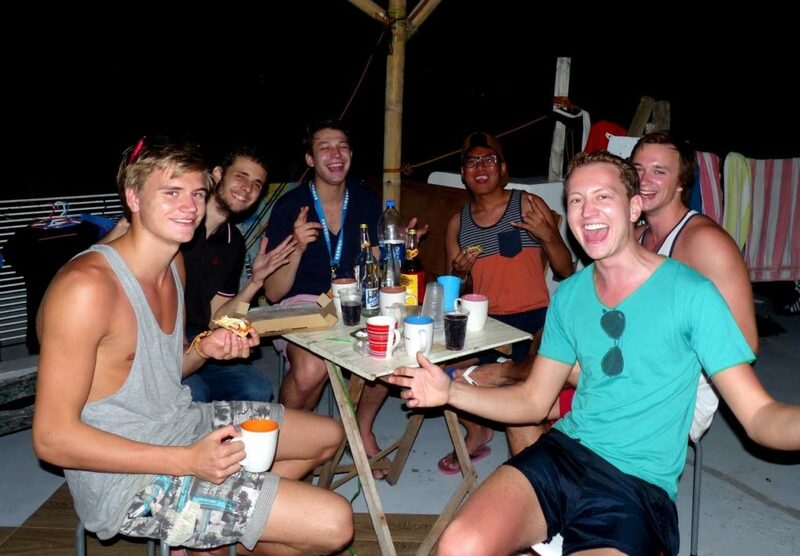 Party peeps at Mad Monkey Hostel Boracay! 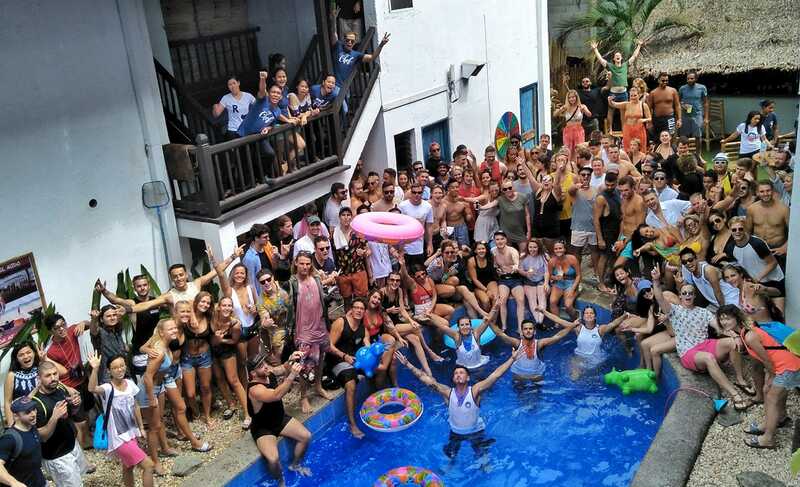 What’s a party island without the presence of Southeast Asia’s biggest chain of party hostels? Officially opened in 2016, Mad Monkey Hostel Boracay is one of the best resort-style hostels for partyholic backpackers looking for the best nightlife in this world-famous island. It’s the same place in Boracay I wouldn’t mind to stay over and over again. I recommend joining their weekly epic booze cruise (island hopping tour with unlimited beer on the boat). Check out their Facebook fan page to see how big the crowd that this tour attracts! Free shots are also given every night during happy hours. For as low as Php 700, you get to spend a night in a pod-style bunk bed with a shared ensuite bathroom, locker, and a personal/reading light. There are private rooms (as low as Php 2900 for 2 persons and Php 3300 for 3 persons) for those who want some privacy. 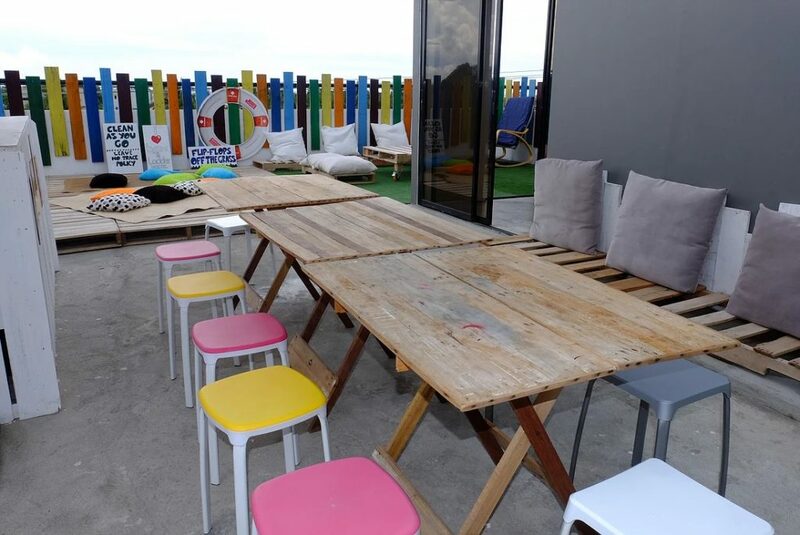 Outsiders who buy drinks at the bar or dine at the hostel’s restaurant are given free access to its swimming pool! The bar closes at midnight to give way to a good night sleep to all the guests and neighbors of the hostel as well. You have two options: go back to your bed or join others to go bar crawling outside the hostel. Just a reminder – if you came to Boracay to find solitude, Mad Monkey may not be the right place for you because this hostel is always full of fun, outgoing, liquor-loving fellow travelers who will do everything to make you drink a beer! 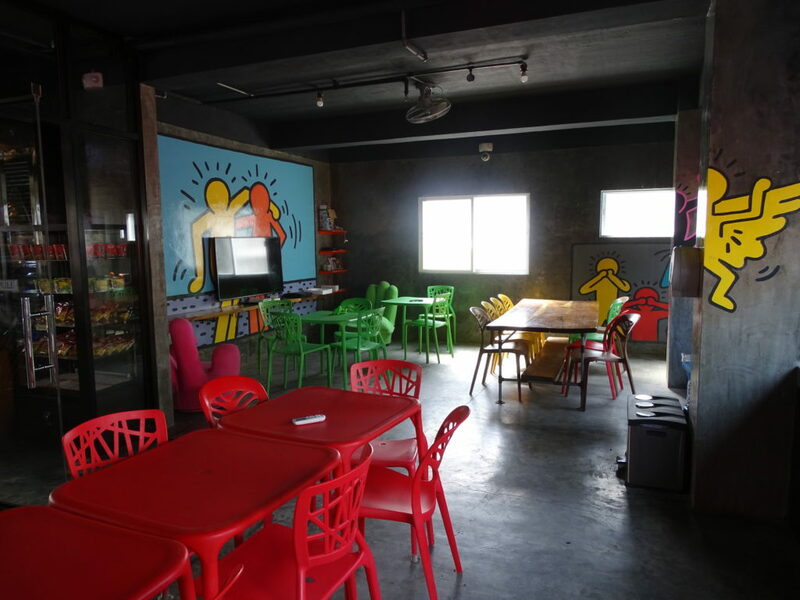 Read Maria Rona Beltran’s detailed review of Mad Monkey Hostel! The MNL Hostel in Boracay was my first choice thanks to its great ratings and reviews online. I spent one week on Boracay, looking for a place to relax, party and meet new friends, and MNL Hostel was definitely the right spot for this. The hostel is located just a few minutes away from the beautiful beach. It has several floors with nice and well-equipped rooms (including lockers and curtains for every bed) and clean bathrooms. Prices start at approx. 10$ and there’s a variety of choice between certain types of rooms (dorms, privates, fan, air conditioning). The complimentary breakfast buffet was delicious with a lot of choice, including fresh fruits, cereals and toast. The English-speaking staff was super nice and happy to give recommendations for the island or to organize trips and activities for the guests. The best part of the hostel was the rooftop terrace, perfect to meet fellow travelers. Especially in the evenings, people gathered together and had some drinks, before heading out to some of the beach bars and clubs of Boracay. I was traveling alone, but soon after I arrived, I already met plenty of other travelers in the hostel and I spent some great days with them. If you’re looking for a clean, well-equipped and social place to stay on Boracay, the MNL hostel is perfect for you! Second Wind Bed, Bunk and Breakfast is located just a 2-minute walk from the main road or a 5-minutes walk from D’mall. It is also near restaurants, grocery, and just 5-10 minute walk to the White Beach Station 2 or the Bulabog Beach, which is famous for kitesurfing. What I love most about Second Wind Bed, Bunk and Breakfast are their friendly and accommodating staff that will surely make your stay comfortable and hassle-free. More to that, their complimentary breakfast may be simple, but it is well-prepared and good enough to perk up my day. Our favorite part of the hostel is the common area where most or the guests lounge – to eat, smoke, watch TV, connect to the internet, read books or just to kill some time. It a good place to interact with your fellow guests and travelers and share some stories with them. That’s what makes staying in a hostel unique and memorable. Located at Station 2 in Boracay, this hostel is located conveniently alongside the main road. If you are coming from the Cagban Jetty Port, just ride the E-trike or regular tricycles, tell the driver to drop you off at the BPI Station 2 Branch. Look for the Ministop Store near the corner, then the Box and Ladder Hostel is just opposite of it. Once checked in, a staff will provide you with a blanket and a towel and be guided to your bunk or capsule bed. All rooms are airconditioned so you need that blanket. Bless them for it. For privacy, a thick curtain is present, light also would not pass easy so once you close off your capsule, you’ll be left in the dark, easy for you to sleep and not be bothered. To secure your stuff, all capsules or bunk beds are provided their own cabinets that can be locked. You may use the utensils in the kitchen like the stove, pots, and pans, and when you do, you should be responsible enough to clean them. Overall, this place is great for backpackers with their cleanliness and guest service, this is a place where I will always want to get back to. WHostel in Boracay was a great place to stay on a party island. Its closer to Bulabog beach making it quieter than the party hostels on White Beach and perfect for anyone who’s looking to go kitesurfing in this tropical paradise. I loved the staff here who helped me pick some great places to see and eat. They suggested I hire a motorbike and go to the lookout at the top which was a lot of fun but more importantly they told me about Ariel’s Point! *Protip* Boracay is known among locals to have the best sunsets of all the Filipino islands! Whether you want to relax in WHostel’s rooftop pool or walk along the sandy beach you better book your room today because WHostel is one of the most popular on the island. Their biggest dorm is only 8 bunks so you don’t have to worry about things getting too crazy like you do with large dorm rooms in other places. 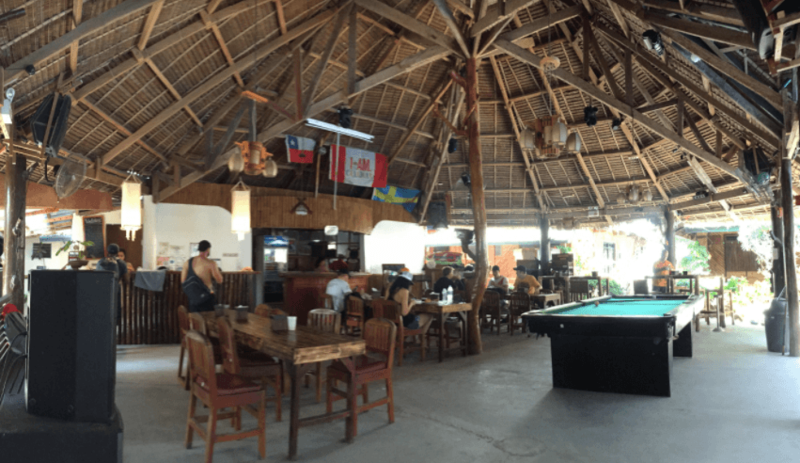 If you’re looking to make friends while traveling then this is a great hostel for you. You can play a few rounds of darts, join some drinking games or relax by the rooftop pool! 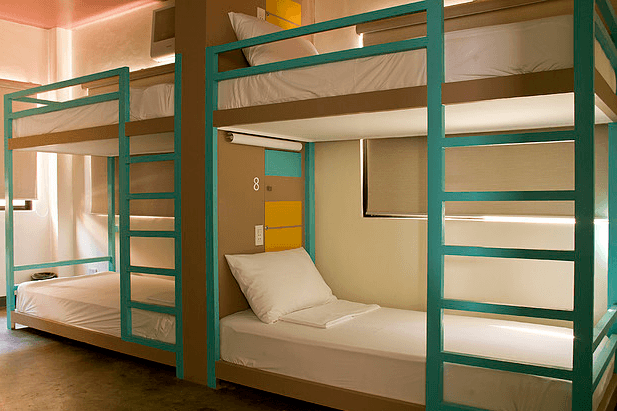 This is one of the cheapest hostels in Boracay that is just walking distance from the beach. What I remember much about my overnight stay here way back in November 2017 is the cleanliness and the simple but very cute free breakfast. You may check out Boracay Backpackers Hostel for more information. Do you want to stay in a more quiet and chill hostel in Boracay? Chillax Flashpackers Hostel might be the best place for you! I discovered this hostel from my trip last February and I loved it! Just three minutes walk from the much calm Diniwid Beach, Chillax Flashpackers Hostel lives up to its name – it is too laidback that it forces its guests to just chill and be still. Upon check-in, they will also lend you a waterproof bag where you can put your things while you lounge in the beach area. There’s also a rooftop pool which unfortunately was under renovation when I stayed there and the free breakfast is delicious. CityMall Boracay is also within walking distance from the hostel. If you’re thinking of staying here, I want to warn you that you must prepare yourself to take a steep ‘hike’ in its staircase. We can feel the summer heat here in the Philippines already! Plan your trip to Boracay and make sure that you have booked an accommodation before flying to Caticlan/Kalibo because tourists (both Filipinos and Foreigners) are required to show their booking confirmation before entering the island. For updated rules and regulations, please refer to my Boracay 2019 post.